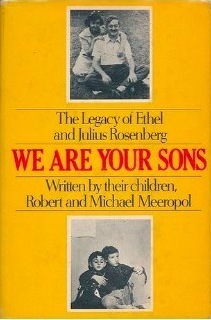 In 1950, Ethel and Julius Rosenberg lived with their two sons on New York’s Lower East side. The boys visited their father’s machine shop on Houston Street, rode subways to the Bronx Zoo, were avid Brooklyn Dodger fans. Abruptly one day their life together dissolved – Julius was arrested, then Ethel. They were accused of “The Crime of the Century” and ultimately sent to the electric chair. Their sons were shunted between reluctant relatives and children’s shelters. Eventually, they were adopted and protected from the public eye. Woven with the letters Ethel and Julius wrote while in prison – many of them previously unpublished – Robert and Michael discuss their memories of that turbulent time. They write about their adoptive parents, Anne and Abel Meeropol, who provided them with security and emotional stability in a culturally rich environment (Abel Meeropol wrote “Strange Fruit,” the anti-lynching anthem made famous by Billie Holiday.) And they talk about their own growth in the politically explosive 1960’s. This books is a vital social document, told simply yet intensely and persuasively. It is a story the reader will not be able to ignore, both politically compelling and personally moving.